Anillo azul cobalto con pluma hecha de vidrio reciclado. Regalo ecológico para ella. Puede que estés buscando algo diferente e inusual, joyas que no se pueden encontrar en todas partes y que no todo el mundo tiene. Reciclo vidrio de ventanas que vienen de edificios antiguos para hacer mis joyas. Cada ventana tiene sus historias, perdidas en el psasdo, pero tu tienes la oportunidad de seguir las historias con este impresionante anillo. Este haría un regalo ideal para una mujer amante de la naturaleza. Lleva una pluma pintada a mano dentro del cristal. Dos capas de vidrio que se han fundido para formar una sola pieza. El grosor del vidrio crea un efecto de profundidad fascinante, y verás burbujas que brillan cuando lo muevas en la luz. La superficie tiene un maravilloso aspecto brillante. El metal es de latón plateado, y es de tamaño ajustable. Recibirás el anillo empaquetado listo para ser regalado. 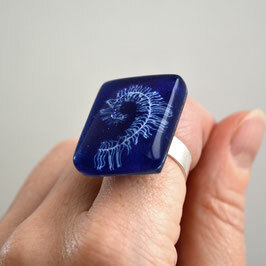 Cobalt blue ring with feather made of recycled window glass. You might be searching for something different and unusual, jewelry that can not be found everywhere, and not worn by everyone. I recycle used window panes that come from old spanish buildings to make my jewelry. 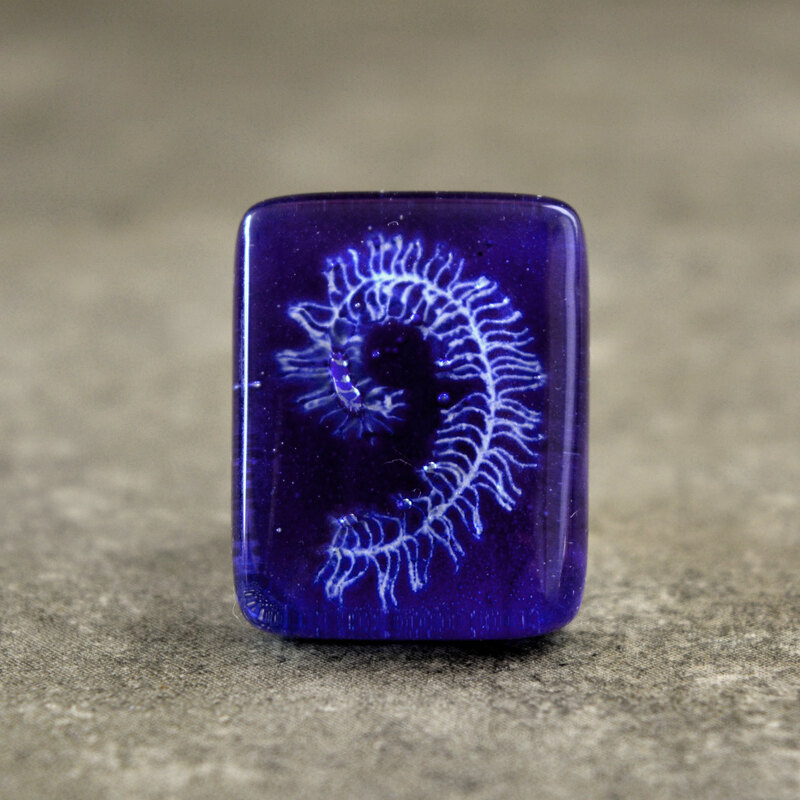 Each window has its stories, lost in history, but you have the chance to bring your own story alive with this unique eco friendly glass ring. 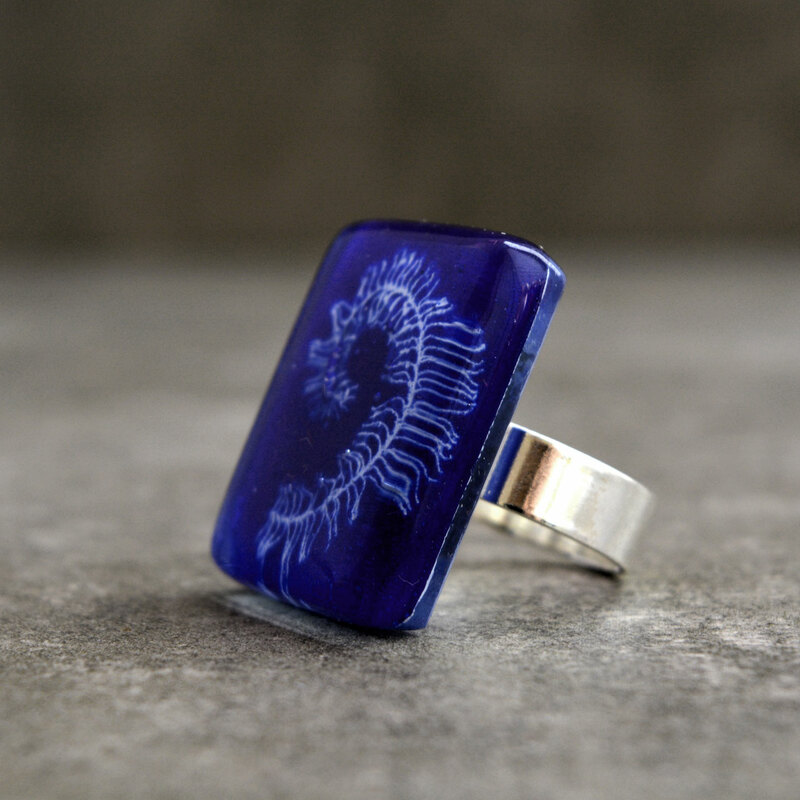 This ring makes an ideal gift for a nature loving woman. It features a hand painted curled feather inside the glass cabochon. Two layers of glass that has melted together to one. The thick glass creates a mesmerizing depth effect, and you will see sparkling bubbles when you move it in the light. I make my jewelry in happy colors so you can be filled with joy when you wear it. I hope you will feel the love and joy I felt when I made the ring. The cobalt blue feather decoration is hand painted using enamels specially made for very high temperatures (1490ºF). The decor is permanent and well protected inside the glass. The surface has a wonderful glossy look that together with the thickness of the glass creates a wonderful depth effect. The silver plated brass ring is adjustable size. You will receive the ring packaged ready to be gifted.